Did you know that “productive procrastination” is a thing? I’m talking about choosing to do something valuable while actively choosing not to do something else valuable. For example, you could choose to dust your living room rather than call your mom. Or vice versa. What I’m not talking about is getting lost for hours in Pinterest or Instagram photos, searching for inspiration you’ll never actually act on. Or clicking through Facebook or online news ceaselessly, looking for something new to read or respond to. Right now, I’m putting off writing about my trip to Peru, and all the tasks that are included in that: identifying photos to share; framing my memories so they are meaningful for you, too; considering how those memories have shaped my creativity, even just a little. And I’m also putting off re-starting one of my quilting projects with the benefit of my new perspectives. Instead, I am working on another VA Hospital quilt. Certainly that is worthy of the time involved. I can’t pretend that it is a high priority — there is no deadline. On the other hand, there’s no deadline for my purely creative adventures, either. They finished at 6″, more or less. The fabric is not particularly nice. And they certainly aren’t pretty. But could they be useful? So what can you do with 10 not-pretty blocks? I decided to use them within a disappearing 9-patch quilt. Mix them in with enough other, prettier fabrics, and they’ll be okay. When I make disappearing 9-patches, I like to use an accent color for the centers of the 9-patches. 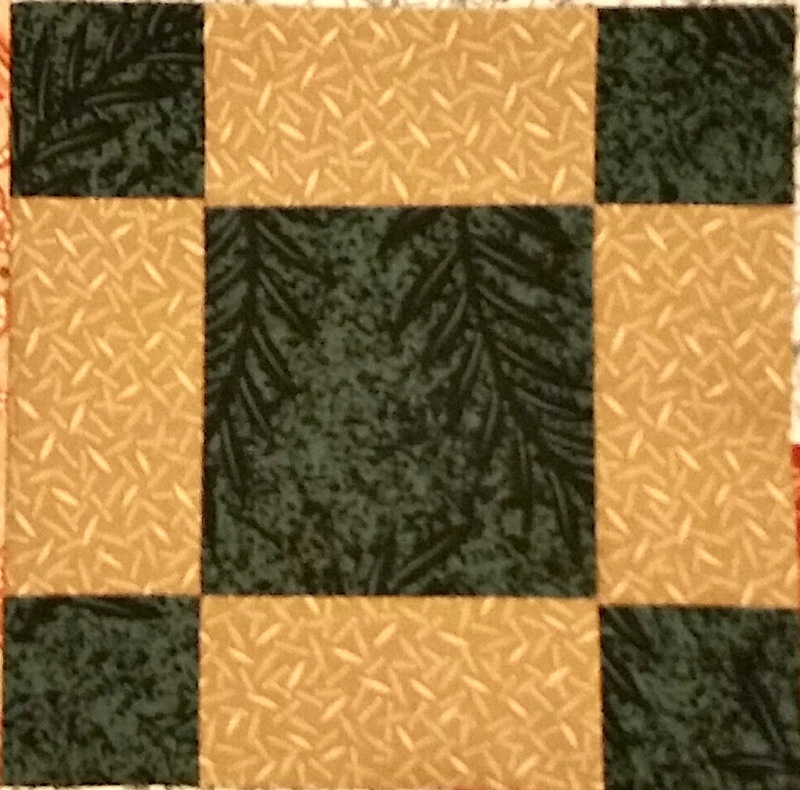 It also is helpful to have value contrast between the large corner patches and the side-centers, which become the “legs.” As I picked through fabrics, I decided to stick with dark greens and dusky blues for the corner patches, rusty oranges for the accent center patches, and lighter pieces for the legs. I made nine large, ugly 9-patches using 6″ finish blocks. All the blocks were unpieced except my green and tan puss-in-the-corner blocks. 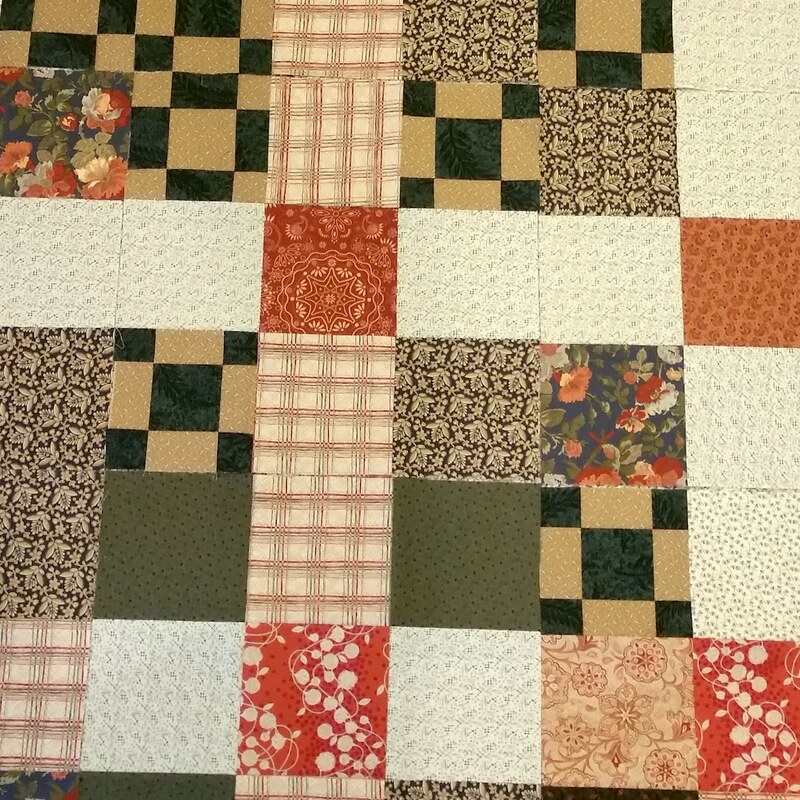 After completing the 9-patches, I sliced each into four pieces, arranged them, and stitched them into a quilt top. The top is now finished. Disappearing 9-patch top. About 44″ x 62″. I’ll need to build a quilt back, quilt it, and bind it. But it will wait as I have another task to tackle in the next few days, one with an actual deadline. What are you working on? Are you procrastinating, forging ahead, or doing both in turn? This entry was posted in Creativity, Quilting and tagged Disappearing 9-patch, Leftovers, Orphan block, Process, Procrastination, VA hospital quilt, Work in process on November 3, 2018 by Melanie McNeil. Looks like a good “save” on those orphan blocks! I’ve been doing this same thing over the last few days, and it’s been enjoyable. While I have projects with deadlines, I’ve been cutting up my scraps. It’s fairly therapeutic, and it seems to feed my creativity. What a fun way to use up those orphan blocks. It’s so satisfying to know they are being used, right?! It is satisfying to use them up! I’m a pro at that in the kitchen. Almost everything gets used one way or another. Now (15 years into this thing we call “quilting”) I’m getting better at it in my studio, too. Thanks! That’s a good result from unpromising beginnings! Procrastination is one of my chief spurs to getting housework done, or for working on something I know I need to do but have been putting off because it’s Just Not Exciting. Yeah, there definitely are parts of life that are Just Not Exciting. Maybe we can learn to be better at embracing them. In the meantime, the productive procrastination is working just fine. Turned out well, good way of incorporating left over blocks. 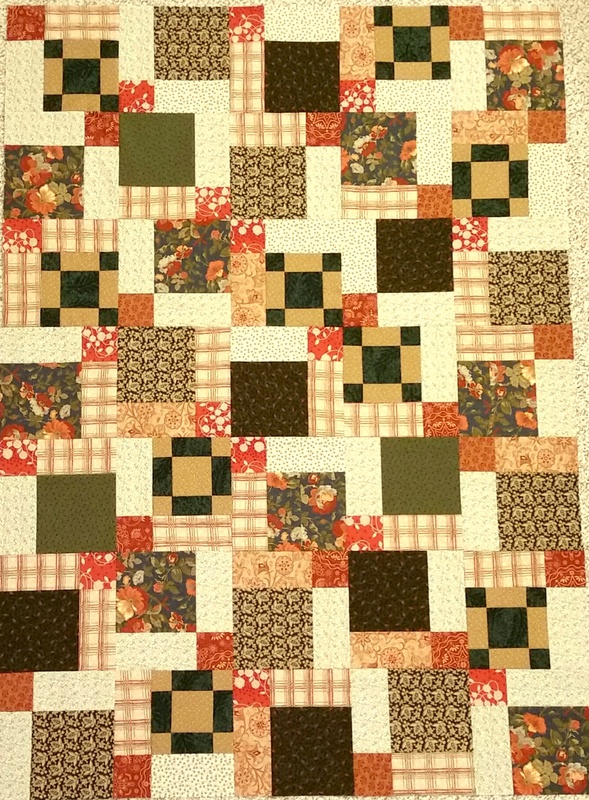 I have so many random blocks here, a sampler quilt with them all would look awful – thinking of cushions for those! We recently moved house, so a lot of time has been taken up with other chores and family visits. But as I was on quilt retreat the other week I had to find something easy (hah) to do. It was fun just tinkering on blocks, as was the retreat – I chose Jacob’s ladder to take with me. The new sewing room is a mess because I haven’t quite got it to my liking, but gradually finding homes for things and making time to sew. Quilting space is rather tight, so a bit of an obstacle there as most of my quilts are large. As for other things like Facebook, I rarely go on there now. 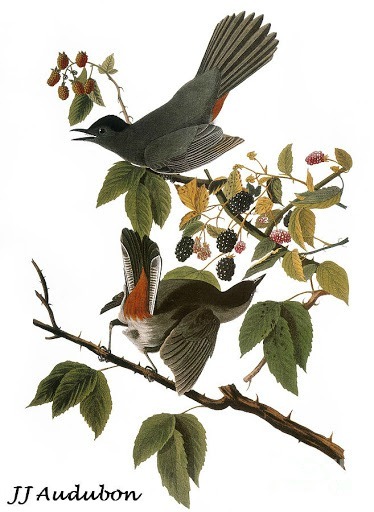 Youtube is a mine of information regarding homesteading (over here it’s called smallholding) – in these winter months nothing much going on outside. Lots of planning going on for the future – which is fun too. Oh yes, planning for the future can be a lot of fun. I spent some time yesterday looking at future possibilities. Not sure that was productive time, but I enjoyed it (and know a bit more than I did before.) As to your random orphan blocks, yes, cushion covers is a great option for that. I should do some of that, too. Thanks for taking a look! I do this productive procrastinating thing all the time. I won’t do one thing (or 10) but I console myself with saying, “at least I went to the gym,” or cleaned the bathrooms, or whatever. Like you, I *need* to be productive, somehow! Well done. I really like this! Do you know if you are going to keep it or gift it? It will be a donation to the local Veterans Administration hospital for a patient. Thanks. I’ll comment on something not mentioned yet: Hubby and I loved the Red Green show!!!! and I can change. If I have to. I guess.” 😀 Oh my gosh. Haven’t seen the show for so long, but it still makes me giggle. Thanks, Laura. What a clever solution! And, yes, I can find many puttery things to do while I put off doing what really needs to get done — whether that’s quilting or not. I’m also reminded of a phenomenon called the “tyranny of the urgent,” A sample is: it’s your last day at the office before a two-week vacation. You get a sudden rush of adrenaline and the inspiration to work on (even to begin) projects you had been ignoring for days. Or in the studio: you’ve had a project on the design wall waiting for an idea for the border (or setting, or whatever). The evening before that trip to Peru you figure out the perfect solution to that design dilemma. Wow, THAT sounds too familiar! 🙂 Yeah, timing is everything, isn’t it? It was nice to see you turn a – let’s face it – boring block into a really appealing quilt with the application of some smart fabrics. I enjoy watching your design eye. And I am definitely the queen of procrastination, but I can still get things done. Just not as fast as I would like! Oh, Maria, I am never as fast as I would like! I tend to be an optimist about how long things will take. Thanks so much. I really like the idea of using already-pieced blocks within a disappearing nine patch! Melanie, I like the final home of the boring blocks and someone will be happy to receive it. Not usually one to procrastinate, I sure find myself doing so the past week. I’ve started several projects and have gotten quite good at tearing them apart. The fact I have so many things I want to do seems to be a barrier to get anything accomplished! Being an optimist about time is another discouraging event. Superwoman couldn’t keep up with my idea of how long it would take to do things! The plan today is to finish something in the stack of UFOs that can truly be accomplished in the time I have to give to it. Staying off the computer will add many hours to my day! Oh indeed, I think it will find the perfect home. Thanks for chiming in! Thanks for a new term to use when my husband inquires about what I’m up to – productive procrastination. It assuages my guilt, yet allows me to put off what I don’t want to do. I love it – “Productive Procrastination”!